Our Garage Storage Solutions Are Designed To Provide You With Accessibility And Safety In Your Garage. Are you tired of looking into a cluttered garage? 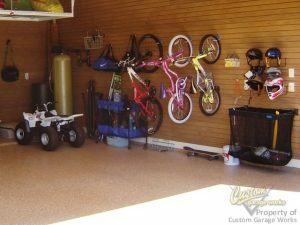 At Custom Garage Works, we do more than premium floor coatings and state of the art car lifts. 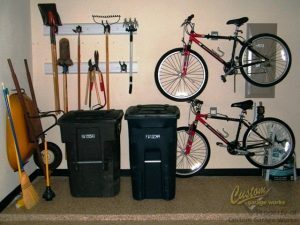 We also provide affordable and effective garage organization solutions. We started this company in 2003 in order to make our own garages more pleasant to spend time in, and we went all-out. After searching high and low within the industry, we weren’t able to find solutions that stood up to the high standards we wanted for our own garages, so we teamed up with different manufacturers to design and provide the most effective solutions in DFW. When you need garage organization services, including garage storage racks in Haslet and Fort Worth, TX and the entire DFW area, call the professionals at Custom Garage Works, at 214-494-9068 or 817-308-1305. No Matter What Your Budget, We Can Help You Organize Your Garage Better Today! Our garage organization services are designed to fit your specific storage needs. We know that just about everything you keep in your garage needs to stay there for a reason. It can be unrealistic just to throw it all away, or move it into a storage facility. Instead, we have a variety of storage solutions specifically fitted to work for garage needs. We sell and install garage storage racks of various sizes, styles, and prices, including overhead racks that utilize the space near the ceiling. These types of racks are ideal for storing Christmas decorations, or other items that you don’t need often. For items you use regularly, we have a reliable wall storage set up that utilizes slat wall, a modern replacement to pegboards. Additionally, we provide high quality, customized Bulldog cabinets, which are designed specifically for garage use. With weatherstripping seals, and the capacity to hold over 1000 pounds, these cabinets are the best on the market for residential garage use, in safety and durability. If you are tired of struggling with a cluttered garage, or it you want to be able to use your garage with ease again, call us at 214-494-9068 or 817-308-1305 and schedule an appointment. Our professional garage organization services are here to help you get the most out of your garage. Whichever system you choose, our contractors will create a CAD rendering of your garage prior to installations. That way you can see how your garage will look before we even begin the installation. With Custom Garage Works, there are no tricks, no gimmicks, just high-quality garage solutions. So when you need organization solutions, or garage storage racks in Haslet and Fort Worth, TX, call Custom Garage Works for the contractors that are passionate about great garages. We look forward to serving you! Updated on September 19, 2018 at 6:38 pm by Custom Garage Works.